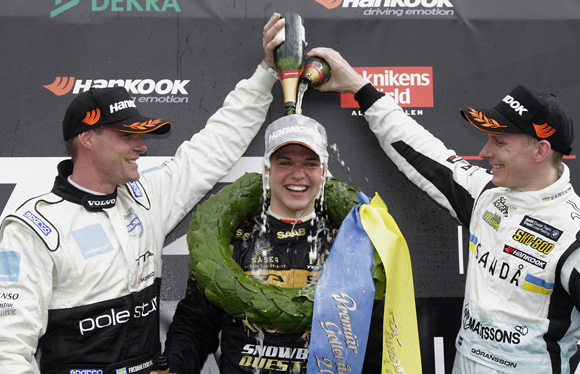 Linus Ohlsson secured the first ever TTA – Racing Elite League victory for Saab and Team Tidö/PWR Racing despite hard pressure from Volvo’s Fredrik Ekblom. “This was the best race of my life. I had a poor start, but was able to pull up a gap after that. This is just so cool, everything went my way and of all my victories, this is my best,” said Ohlsson. The 21-year-old was challenged by Ekblom in the start who had a better start. The both went side-by-side in to the first corner, but as Ekblom got the outside, Göransson was able to sneak past up in to second. Ekblom had to hunt back on Göransson and got past after a couple of laps. The chase was then on for Ohlsson and Ekblom gained. There was just three tenths between the both after 31 laps, interrupted by one safety car session. “It was a great race and we got important points for the championship. I caught Linus but I didn’t want to do anything stupid. I am impressed by Linus, he drove really well, but he is not going to get it easy for the rest of the championship, I can promise you that,” said Ekblom. Göransson was unable to keep the pace of the leading duo and fell back. The BMW driver had to defend from Thed Björk in fourth, but managed to pull up a gap towards the end of the race to secure third. “I am pleased. But we didn’t find the right setup and I couldn’t match the pace of Fredrik and Linus. The fight is on for real now and we are going to be back at Anderstorp, no doubt,” said Göransson. Björk finished fourth as well as the team championship lead for Volvo Polestar Racing. Fredrik Larsson was last man in to the top five with Robin Rudholm close behind. “I am a bit disappointed, our so-and-so qualifying session haunted us to the race. Sixth is okay points, but there is nothing else but a return in the top at Anderstorp in three weeks for us,” said Rudholm. Stefan Söderberg was best Citroën driver in ninth behind Martin Öhlin and Daniel Haglöf, with Anderas Ebbesson rounding off the top ten. Tommy Rustad and Viktor Hallrup retired with 11 laps to go after a spin from Rustad and Hallrup being unable to avoid the Volvo. Rustad’s team mate Robert Dahlgren only made a few meters from the start as the clutch failed. Fourth Citroën driver Mark Miller never made it to the race due to technical problems.